St. Augustine (354-430) was one of the most prolific and influential writers of the early Christian Church. Some of his many writings were among the bare essentials which every medieval monastic library ought to own. His commentary on the 150 Psalms was often written in three volumes (which would have covered Psalms 1-50, 51-100, and 101-150 respectively) of which this is the second. 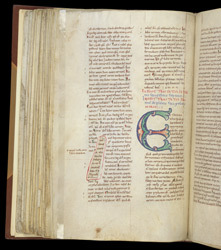 It has an inscription stating that it was written under Arnulf, Prior of Rochester; by 1107 he was no longer prior, so the manuscript must be earlier than that date.. Near the decorated initial 'E' to Psalm 68 is a roughly rectangular hole, a natural flaw, in the parchment. The scribe simply avoided the hole, and the decorator later drew a red line around it.